2. Ouai Product- My absolute favorite hair product brand! They have every product you could imagine and all for very reasonable prices. My hair always feel as soft as silk after using their products. I can not say enough good things about Ouai. 3. Gisou Products- A brand created by Negin Mirseli (my favorite influencer). Every product is infused with honey and infuses and replenishes your hair with the vitamins that it needs. I mean these product just give you hair goals!! 4. Silk Pillow Case- You may not have heard of this before but silk pillow cases are the new best thing and give you the ultimate beauty sleep. These pillow cases help you skin and the health of your hair. 6. 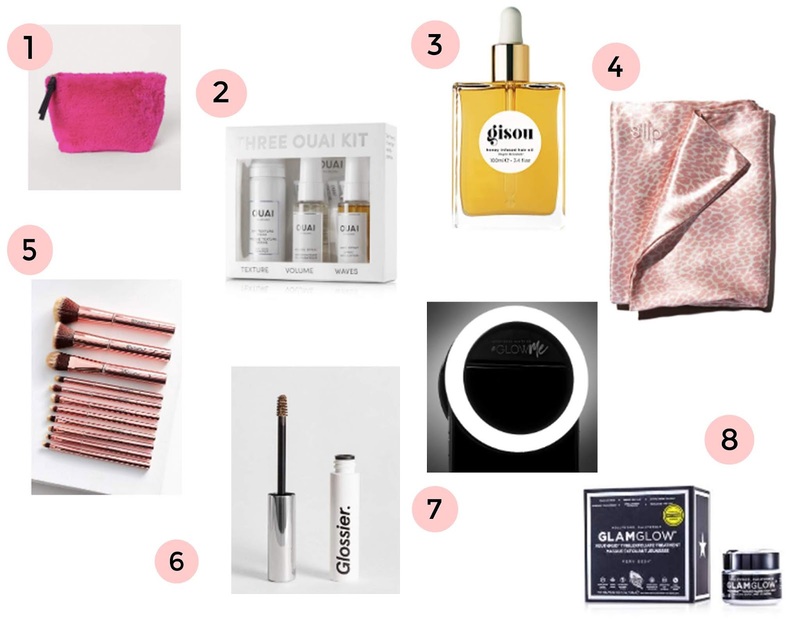 Glossier Products- I swear glossier has to be the beauty brand of the year. They created something unique and that was not on the market. They target an audience of someone who love a healthy dewy look. They don’t only sell the most amazing beauty products but also amazing skin care! Some of my favorite products include their boy brow, the balm dot com, cloud paint and their lip gloss. 7. LED Mirror- You need the perfect lighting to apply the perfect face of makeup. This LED light will help you achieve makeup goals. 8. Face Mask- They have become the new fanatic in beauty this year, and to be honest, the hype is real and they work wonders. There are so many options out there but my favorite has to be the Glam Glow charcoal face mask. It may be a little pricey compared to other fave masks but it last longer than a lot of other face masks I have tried out.